uKit is a powerful website builder with small business in mind. Today we bring you a collection of real websites created using this code-free site creation platform. When you build a site with user-friendly platforms like uKit, it’s easy to create a good web presence. But it’s both an art and science to make it effective. An effective business site is easy to find, allows you to winningly present your services/products, connect with new colleagues, make sales, and find new offers. So let’s see whether it’s possible to create an effective website without writing a single line of code. 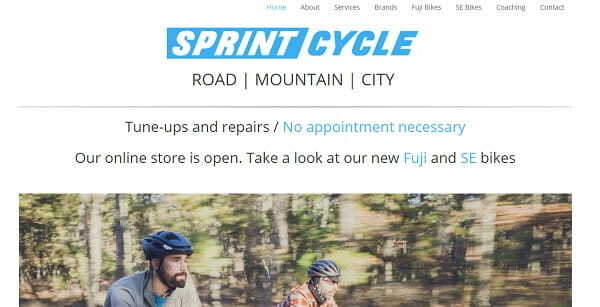 Sprintcycle.ca is a website of a full-service bicycle shop, offering a rich assortment of products, accessories, bicycle parts, bikes as well as repair and tune-up services. The owner and manager of the store, Marian, has more than 45 years of the cycling community experience. The website comes with intuitive navigation that grants access to the most important menu sections, namely About, Services, Brands, Fuji Bikes, SE Bikes, Coaching and Contact. The photo slider available at the home page makes it simpler to feel the general atmosphere of the website due to the thematic photos. You can join the groups of the web store in the social networks, feel out the contact form and find out physical web store location details directly at the website. This is very convenient and time-saving. 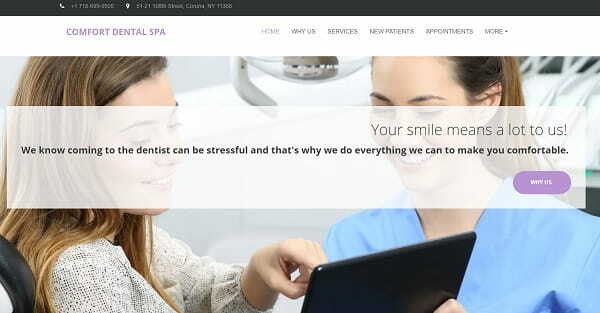 Сomfortdentalspas.com is a website of a dental clinic, which sees its mission in providing clients with the utmost level of comfort and relaxation. The website completely comes up to the major niche specialization, offering explicit information about the clinic, the services it offers, info for first-time patients and contact details. These aspects are reflected in the sections of the website menu provided at the top of the homepage. Reviews of regular clients and the benefits that distinguish it from other dental clinics are also available at the homepage. To get in touch with the customer support team, you can either fill out the online form found in the footer or use the contact data. It’s also possible to make an appointment online in the corresponding website section. A nice sample of a uKit-powered website. 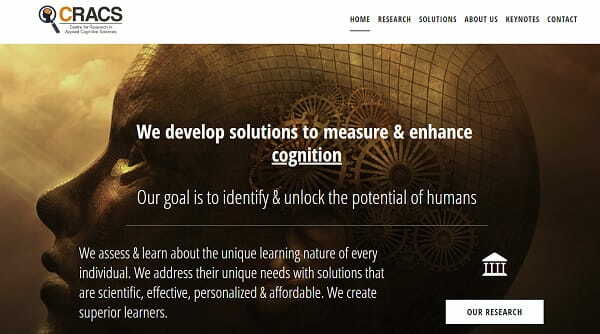 Cracslab.com is a website of the center involved in the research of applied cognitive sciences. They focus on the development of advanced solutions to measure and improve cognition with the purpose to identify and reveal human potential. The website is logically-structured. It features simple navigation as all the elements and sections are on their places here. As you browse the website, you will come across the services the center offers, cognitive science solutions and contact details. The homepage comes with a full-screen image slider, featuring information about the center and the video, where you can find out more about it. The website abounds in thematic images and related information that helps you find answers to all the questions you might have. If you face problems with your computer or any other device, then Megabytemedics.com is a top notch destination that can help you find the solution that really works! The company has been in business for over 15 years, providing exceptional customer service and helping fix lots of types of devices. The About Us section of the website menu will provide you with detailed information, while the Services section will offer the list of options you can avail, when using them. As you get back to the homepage of the website, you’ll be able to read customer reviews and request the same-day quote by using the contact info available at the home page. 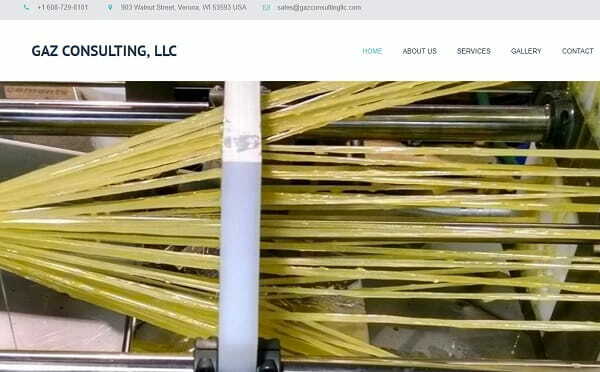 Example 5: Gaz Consulting LLC. Gazconsultingllc.com focuses on offering tools and machine design support that might be of great use in the composites industry, which puts the major emphasis on the pultrusion process. The company is involved in designing high quality machinery and tooling to maximize the process stability and bring down the maintenance requirements. The website of the company complies with its specialization, providing the list of services, the major company highlights, the product gallery and the contacts all available in corresponding menu sections. If you wish to find out the company info, this website will certainly be a handy tool! 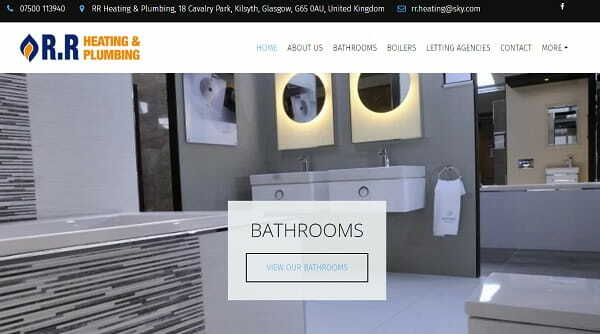 Rrheating.co.uk is a website of the Glasgow-based heating and plumbing company, which offers a broad range of services in the surrounding area. The company is great at boiler replacement and installation, plumbing services, power flushing, landlord gas safety inspections, bathroom design and other related services. You can find out more about them by visiting corresponding website sections. A large slider available at the homepage will provide you with quality photos of bathroom design samples so that you could personally evaluate the company work. Wish to apply for a free no obligation quote or book an appointment? You are welcome to do that by filling out the online form or by getting in touch with the company customer support team in person. 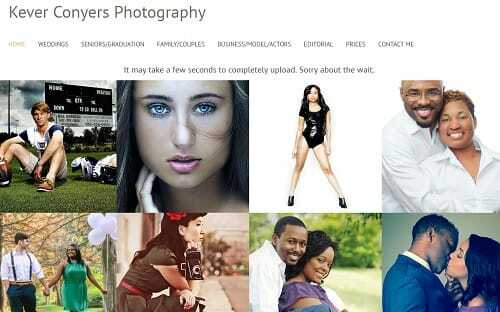 Keverconyersphotograhpy.com is a vivid sample of a quality and appealing portfolio website. It belongs to Kever Conyers III – the photographer with years of experience, who aims at presenting his works to users and successfully does that at the website. This website includes all the elements that are crucial for any portfolio. There is nothing superfluous here – all the elements are on their places. High quality photos displayed against the snow-white background is what attracts the attention of a visitor right from the start. It’s possible to enlarge each photo to view the details by simply clicking on it. There is also a brief info about the photographer and a callback widget in the low corner of the homepage, which is a convenient option for visitors, who value their time. The portfolio itself is subdivided into thematic categories and there are also special categories with pricing and contact info. A nice and informative example of a portfolio website! Cdmacademy.org proves that site builders like uKit are a great option for non-commercial organizations. 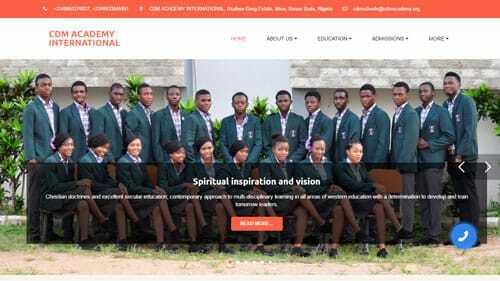 CDM Academy is an International Secondary School in Benue State of Nigeria. The website offers lots of useful content for potential and current students, as well as their parents. There is a curriculum section, a documentary video about the school, online forms, information on entrance examination etc. The site is also well-branded: it has a cohesive color scheme that matches the Academy’s logo and email address in the website’s domain – cdmschools@cdmacademy.org. The website has more than enough info on the academy. The only thing I would add is a couple of videos. 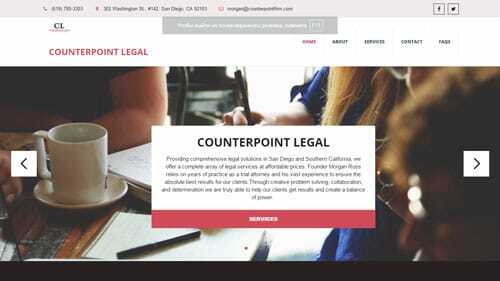 If you are going to build a site for your business with uKit, take a look at counterpointfirm.com. Morgan Ross, the founder of the law firm, used uKit website builder to promote his legal services online. The website looks good with the red, black, and white color scheme, a custom favicon is always a plus. A lot of information about the founder of the firm is a good move, because you need to know if your lawyer has the right qualities for the job. There is no testimonials page which can be very useful for such business. One of the other concerns is the FAQs page – it’s totally wrong, there are no questions at all. 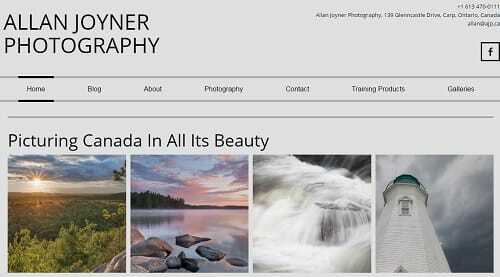 Allanjoynerphotography.ca – picturing Canada In All Its Beauty – that’s Allan Joyner’s motto and that’s exactly what he does. Let’s start with the tiny minuses of his website. The Blog section is empty, with no posts – even if they will be added soon, it would be better to hide the page from the navigation menu for now. The testimonials listed under Training Products could be highlighted better. But everything goes to the back burner when you look at these Canadian photos, they’re a real masterpiece. The color scheme is not perfect for text information, but it’s brilliant for photos and images. Forget everything I said earlier – the website is flawless! Emma began her massage eduсation at the Ann Arbor Institute of Massage Therapy in 2010 studying Swedish Relaxation, Myofascial Release, Sports Massage, and Neuromuscular Therapy. Sounds like a real deal, probably that’s the reason why egmassage.com is a simple website, but an effective one. Though every element is nothing but simple, it’s not a bad thing. The website is easy to use and all info can be reached at once – contact details, services and rates. 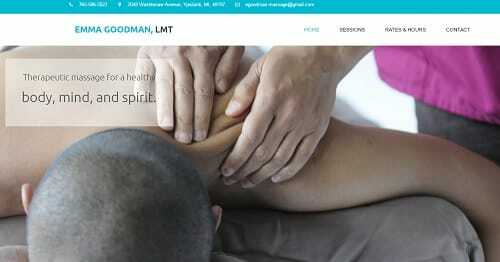 It would be nice, though, to have something to make the website more personal, such as a video or the masseur’s bio. 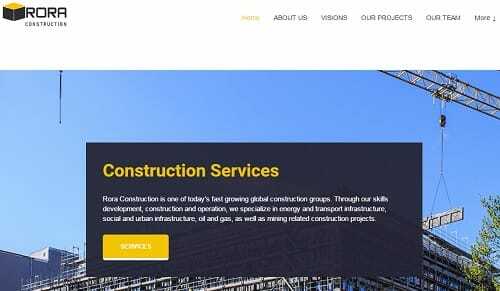 Roracc.com is one of today’s fast growing global construction groups. They are rookies on such a big market as the construction one is. From the very first look you understand what the website is about and what services the company provides. All these yellow stripes and black spaces look awesome, and the custom favicon is very simple, but stylish. Images of their projects are really that cool and if they were larger, they would be even more epic. Functionally the website is easy-in-use but I can’t but ask one question: why there’s a separate section for Vision? There are just a couple of sentences. And in the bottom part of the Home page, there is a schedule image of a very low quality. Pacificcommercialbrokers.biz is a website of a real estate agency, which provides the info a user might need all in one place. The website is logically structured and comes with intuitive and easy-to-navigate interface. 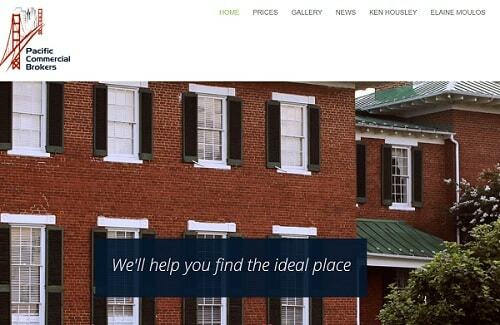 The first thing that attracts user attention is a large image of a house with a company’s slogan on it. The slogan conveys the major message of a website, while the image and the logo of a company look contrasting at the white background. There is no need to look for the basic company info – just scroll down the page and find what you need. If you still wish to find out more, then browse the sections of the website available in the menu. This is where you will find the pricing policy of the company, the gallery, the news and the info about the owners. All in all, the website is simple yet functional and user-friendly. Ambwindows.co.uk has been in business for nearly 10 years, having worked tirelessly to build a reputation based on honesty, integrity, and customer service. And those are not empty words, because the first thing you see is the testimonials of their customers who share their experience working with AMB Glazing. There’s a big difference between a professional approach in website building and “ah, that’ll do”. Easy to understand navigation, quality images, every detail in its place – these are the distinguishing features of the website. I like their black, white and blue colors, it’s looking solid, but still fresh enough. With the right attitude, uKit website builder can be an irreplaceable asset for any sort of business. You need to make a real effort to transform its navigation into a total disaster. Plus, the prices are very affordable. You’re not limited with themes and business niches for your website. Medicine? Why not?! Construction sector? Piece of cake. Yoga or an online shop? Consider it done! Blog-alike websites are the only exception with the platform – the blogging feature is available but can’t say it’s very convenient for a full-featured blog. In total, uKit is one of the best solutions on the market, mostly because of its versatility.